« The new gTLDs are here! The development team at R4L has added a new security feature for account login called Two Factor Authentication (TFA). Once configured, TFA will automatically generate a new 6 digit code every 30 seconds, and this is required with your current login password in order to access your account. A QR scanning app on your device. There are plenty of free ones you can install. 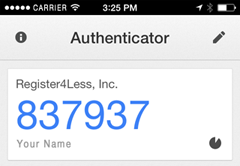 The Google Authenticator app. Also free. Click the Generate Secret button. The page will reload with your QR image. Tap Scan Barcode, and then scan your QR image. Authenticator is now configured for your account. The next time you log into your account, you will need your device with you. Enter in your domain, username and password as usual, then open Authenticator, and append the six digit code to your password. Find this post helpful? Want to suggest ideas for other blog posts? Write to our support team to make your suggestions and we’ll do our best to get this added for you. This entry was posted on Friday, April 25th, 2014 at 2:49 pm	and is filed under Login Security. You can follow any responses to this entry through the RSS 2.0 feed. You can leave a response, or trackback from your own site. Will two factor be required? TFA is not required. It’s an optional security feature. Thank you for this. I use Google Authenticator on all my WordPress sites (added with a plugin) and it adds a much needed level of security. It’s great to hear that my domains are now protected too. BTW, there is an app for the Blackberry too. As Google Authenticator data is not backed-up (for obvious reasons) how does recovery work in case of a broken / lost / stolen device? @Martijn: you would need to contact us in order to recover from this.